A gable roof is the simplest and most common roof found in single-family residential homes and consists of rafters forming an A-frame. The two critical factors are rafter size and resistance of lateral forces. Typically the attic floor will serve that purpose, with floor joists running parallel to the rafters, effectively tying together the far ends of the structure. However, where an attic floor is not available due to a cathedralized ceiling or other irregularity, additional support is necessary. This may c onsist of collar ties, which are short connectors between opposing rafters, typically near the ridge. 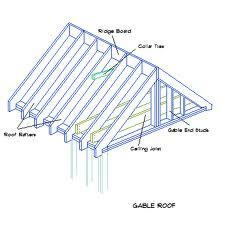 It may also consist of reinforcing the ridge beam or bracing the ridge with an interior wall. Use of an interior wall to brace a structural ridge beam, however, requires consideration of the load path below, as the interior wall must itself be supported.